Research shows that critical thinking is a key leadership skill for today’s organizations. Good critical thinking can lead to better decision making and problem solving for leaders and their teams. In a recent study by the American Management Association, nearly 70% of respondents ranked it as the most important skill for helping grow their organizations. As leaders, we are all being asked to make increasingly complex decisions and to solve unique problems. That’s why it is so important to make sure we sharpen our critical thinking skills and make sure we are using the best tools at our disposal. Next week I’ll be working with leaders at one of our campuses to help them better understand their preferred approaches to problem solving and decision making and introduce them to a critical thinking model featured in a new book, called Now You’re Thinking by Judy Chartrand et. al. Take time to reflect and set direction. Ask: What are we trying to accomplish? What is going on here? Is the situation urgent? Is it important? Distinguish facts from opinions and check for implicit assumptions. Make sure you are solving the right problem. Ask: What do we know about the situation? What don’t we know? What are the important facts? Opinions? Evaluate the range of information available to you. Ask: What information is needed? Is it relevant and accurate? What key factors or criteria will lead to a successful outcome? Draw a conclusion that logically flows from the previous steps. Ask: Does the conclusion fit the evidence? Achieve my/our goals? Create a plan of action that will help people move forward to achieve the desired goal. Ask: What processes need to be developed to achieve our goal? What resources are needed? How will we communicate our plan? How will we monitor and evaluate progress? What is our Plan B, if this solution or decision does not work out as planned? I like this critical thinking model because of its simplicity and ease of use. However, it is just one of the tools available to leaders to arrive at better decision-making and problem solving. 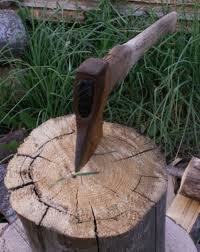 What tools have you used to sharpen your axe and improve the quality of your decision making? What would you recommend to other leaders? This entry was posted in communication, decision making, Leadership. Bookmark the permalink.